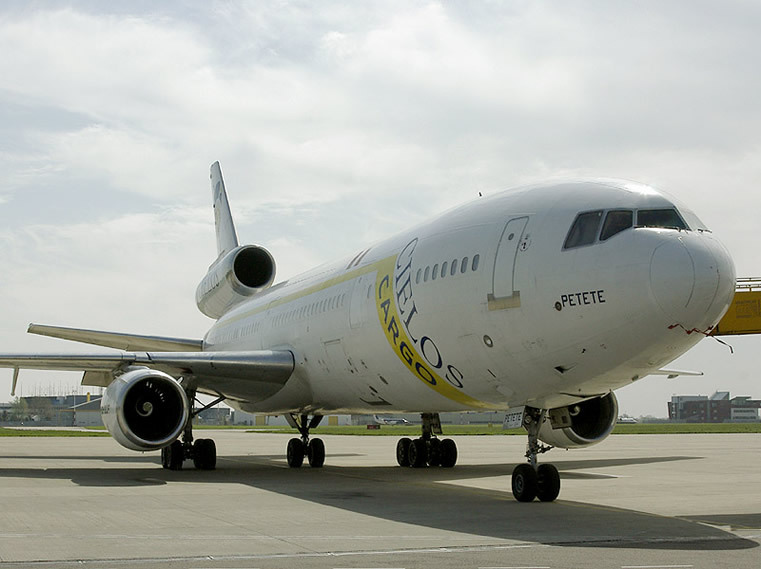 The McDonnell Douglas DC-10 is a three-engined long-range airliner, with two engines mounted on underwing pylons and a third engine at the base of the vertical stabilizer. 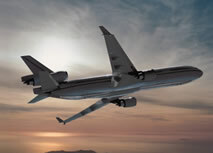 The model was a successor to the Douglas DC-8 for long-range operations, and competed in the same markets as the Airbus A300, Boeing 747 "jumbo jet", and the physically similar Lockheed L-1011 TriStar. Some were built for the United States Air Force as air-to-air refueling tankers, designated the KC-10 extender. 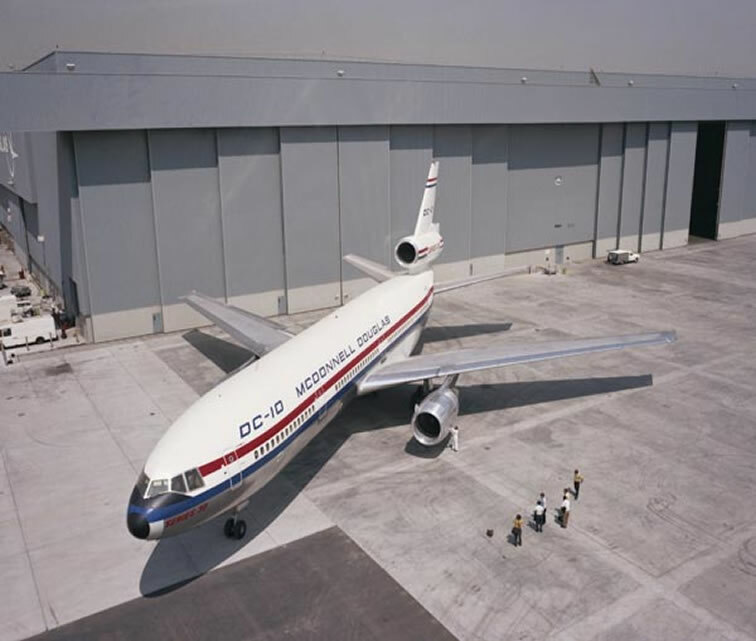 The DC-10 was McDonnell Douglas's first wide-bodied commercial airliner, built to a specification from American Airlines for a widebody aircraft smaller than the Boeing 747 but capable of flying similar long-range routes. 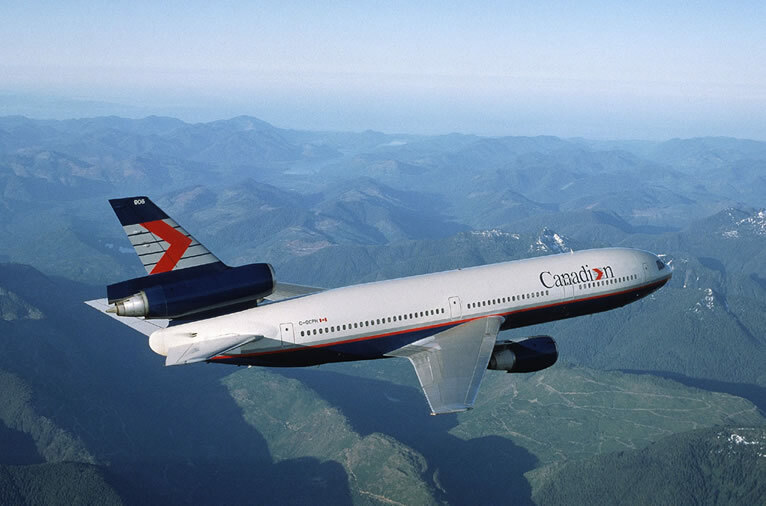 It first flew on August 29, 1970 and entered commercial service in 1971, nearly a year before the Lockheed Tristar (which was built to the same specification). 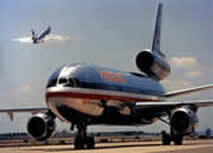 Although the DC-10's lifetime safety record is comparable to that of other heavy passenger jet aircraft, the DC-10 suffered a trying time during the 1970s when a string of highly publicized crashes resulted in a brief grounding by the United States Federal Aviation Administration. Unlike most other aircraft, the DC-10 was designed with cargo doors that opened outward instead of inward. This required a heavy locking mechanism to secure the door against the outward force caused by pressurization of the fuselage. In the event that the door lock malfunctioned, there was potential for catastrophic blow-out of the whole door. This problem was first identified in 1972 , when American Airlines Flight 96 lost its aft cargo door after takeoff from Detroit; fortunately the crew were able to perform an emergency landing with no further incident. On Flight 96, an airport employee had violently forced the door shut, weakening the locking pin and causing the door to subsequently blow-out as it reached altitude. McDonnell Douglas attempted to place the blame on the employee, who they described as "illiterate", and deflected criticism of the aircraft design itself. Although many carriers voluntarily modified the cargo doors and re-trained their ground crews, there was no mandatory redesign of the system. Severe design problems persisted with the aircraft's cargo doors. Indeed, two years after the American Airlines incident an almost identical cargo door blow-out befell Turkish Airlines Flight 981, which crashed into a forest shortly after leaving Orly Airport in Paris. 346 people were killed in one of the worst aviation disasters of the twentieth century. The circumstances surrounding this crash were similar to those surrounding the previous crash; however, a modified seating configuration on the Turkish aircraft exacerbated the effects of decompression and caused the aircraft control cables to be severed, rendering the aircraft uncontrollable. In the aftermath of this crash, all DC-10s underwent a mandatory door redesign. The DC-10 was starting to get a reputation as a dangerous aircraft. Perhaps the most infamous instance of a DC-10 crash was the Flight 232 disaster at Sioux City, USA, in 1989. After an emergency landing with no hydraulic controls available to the crew, the aircraft was completely destroyed. 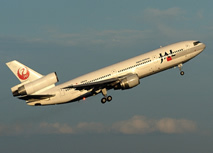 The crash ironically pointed out one of the DC-10's unique safety features: it is one of the only aircraft in the world that can be flown solely by throttle, without using rudder, elevators, or ailerons. After the hydraulics failed on Flight 232, the pilots were able to crash-land the plane; although many died, over half of the passengers walked away without major injury. The 446th and final DC-10 rolled off the production line in December 1988 and was delivered to Nigeria Airways in early 1989. Despite its troubled beginning, the DC-10 ultimately proved — and continues to be — a reliable aircraft, much loved by engineers and pilots. The aircraft's safety record continually improved as design flaws were ironed out and fleet hours increased. In fact, the DC-10's lifetime safety record as of 2003 is comparable to similar second generation passenger jets.